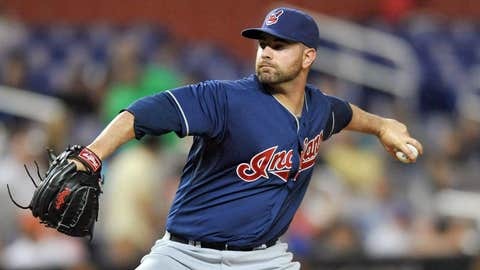 Relief pitcher Marc Rzepczynski and the Cleveland Indians have agreed on a one-year deal worth nearly $1.4 million. CLEVELAND (AP) — The Indians avoided salary arbitration with reliever Marc Rzepczynski by agreeing to a one-year contract worth $1,375,000. The left-hander posted a 0.89 ERA in 27 games last season for Cleveland, which acquired Rzepczynski (zep-chin-ski) on July 30 from St. Louis. The 28-year-old was brought in to help Cleveland’s issues in getting out left-handed hitters and he held lefties to just a .159 average. Rzepczynski was one of six Cleveland players to file for arbitration. Earlier this week, the team worked out a 1-year deal with reliever Josh Outman. Top starter Justin Masterson, left fielder Michael Brantley and pitchers Vinnie Pestano and Josh Tomlin also filed for arbitration. The Indians haven’t gone to an arbitration hearing since 1991.